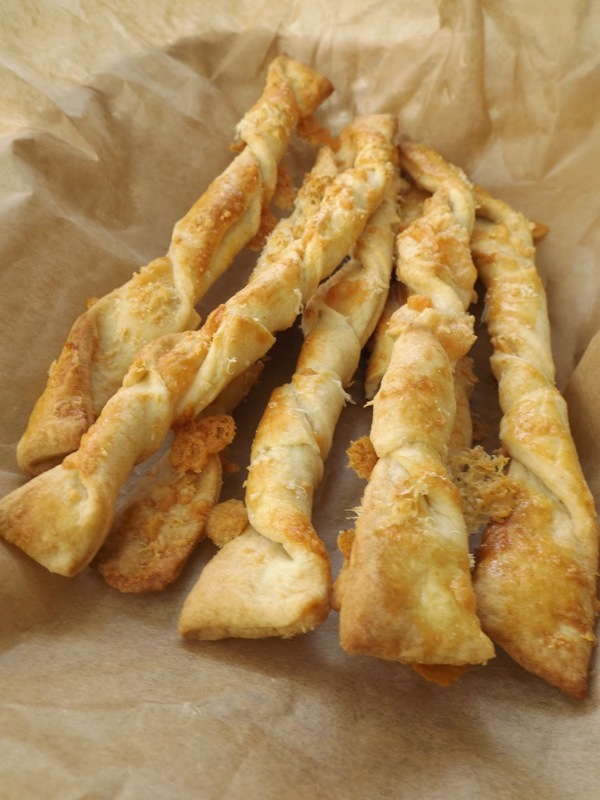 Whenever you have left over pastry these are an easy and delicious way to make something worthwhile out of a few scraps. If you have made a tart for a dinner party and have leftovers you can then make some great easy, quick canapes to hand round in an instant. Then twist your strips. the cheese will fall out and all over the place but don't worry just stick it back on the sticks and into the little gaps now formed by the twist. Pop in the oven for about 5-10 minutes or until golden - just keep an eye on them as they will catch quickly and your scraps really will then be wasted! Crinkle some baking parchment and place into a basket or into a tall glass, great for a film snack or party canapes.